It’s much more important than just smoothing out a bumpy ride. To maintain precise control of your vehicle, you need to be able to steer properly, which in turn requires a fully functioning suspension system and proper wheel alignment, two areas of auto service expertise for Midas. 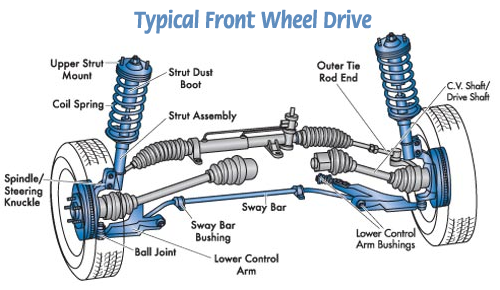 Your vehicle’s suspension is made up of a variety of shafts, rods, arms, joints, springs, absorbers and knuckles, as illustrated below. Whether your vehicle has a conventional suspension system with shock absorbers or a strut–based system (which is typical for many of today’s front–wheel drive models), Midas has the know–how to diagnose and repair the problem. Our expert mechanics can also uncover alignment trouble and help you get back on track. Here are a few symptoms to watch for if you think you are having steering, suspension, or alignment problems. Excessive tire wear, poor steering control or an off–center steering wheel are all signs that your vehicle may have steering or suspension issues. It could also indicate improper tracking that results from your car’s wheels being an unequal distance from the centerline. Symptoms of bad shocks, struts, or worn springs include excessive bouncing over road bumps, loss of control during sudden stops, excessive swerving while changing lanes, front–end nose diving during quick stops, and vehicle sag in front or rear. If you experience any of the above, bring your vehicle to Midas for an alignment inspection or steering and suspension inspection. It’s important to have your car aligned whenever you replace any major suspension components or if you notice unusual or irregular wear patterns on your tires. Getting your car aligned is a relatively inexpensive procedure, and it could end up saving you a lot in terms of longer tire life, better fuel economy, and safer handling.